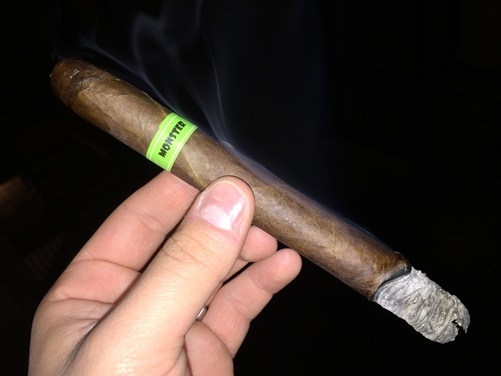 “Hopefully I can hang on to a few The Jekyll’s to do a side-by-side comparison next year.” That’s what I wrote back in November 2014 in my review of last year’s Monster Series cigar from Tatuaje. I can actually remember typing the word “hopefully” while knowing it was highly unlikely I’d have the willpower to keep my hands off my box of The Jekyll, a cigar I rated four and a half stogies out of five. As it turns out, my 10-count box is long gone, and with it my ability to do a suitable side-by-side comparison of this year’s follow-up, The Hyde. Fortunately, my colleague informs me he still has a few The Jekyll’s in stock, and he was also able to recently purchase a box of The Hyde; so I expect a Face-Off from him shortly. After all, comparing the two cigars is only natural. They’re based on similar blends, and both are a nod to the 1886 novella Strange Case of Dr. Jekyll and Mr Hyde by Robert Louis Stevenson. Thanks to the well-publicized rarity of Monster Series cigars, the success of Tatuaje’s marketing, and the sterling reputation Pete Johnson’s company has amassed over the years, I probably don’t need to remind you that, since 2008, Tatuaje has released an annual Monster Series smoke around Halloween. Each celebrates one of Johnson’s favorite characters from the horror genre, including The Frank, The Drac, The Face, The Wolfman, The Mummy, and The JV13 (Jason). As is tradition, Johnson produced 666 “dress boxes” of 13 The Hyde cigars, with 13 “unlucky” retailers getting the bulk of the boxes to sell. He also released 4,500 plain 10-count boxes, equating to a total run of just under 54,000 individual sticks. Like The Jekyll, The Hyde measures 7 inches long with a ring gauge of 49 and has a tapered, rounded cap. Whereas The Jekyll featured a lighter Ecuadorian Sancti Spíritus wrapper around Nicaraguan binder and filler tobaccos, The Hyde sports a darker Ecuadorian Sumatra wrapper over Nicaraguan binder and filler tobaccos. The Hyde is also distinguished by its green band with write font; The Jekyll had a white band with green font. The Chuchill-sized smoke is notably oily with a few prominent veins and some imperfect seams. The uneven coloring makes it particularly rustic in appearance, though I find the cap style is quite appealing. At the foot, the pre-light notes are incredibly sweet and chocolatey with a hint of damp earth. The flavor reminds me of the Frango chocolate mint candies that used to be found at Marshall Field’s in Chicago. Creamy, sweet, chocolaty, minty, and mouth-watering. Background notes include graham cracker, light cedar spice, tea, caramel, herbs, and almond. Smoking too quickly tends to bring out some bitterness, but a paced approach will yield a medium-bodied profile that’s sweet, creamy, and enjoyable. Throughout, the draw is a little stiffer than I would like, which also limits the smoke production. The burn line—while not necessarily perfect—is well-behaved, and the ash holds well off the foot. To date, my favorite Monster Series smokes have been The Mummy, The Franc, and last year’s The Jekyll, which is spicier and more bready than The Hyde. That said, The Hyde stacks up quite well to its predecessors. And you have to give a lot of credit to the uniqueness of the flavor (which is what you want from a $13 cigar that will be tough to track down). That’s ultimately what makes this creamy, minty, chocolaty candy bar of a cigar worthy of four stogies out of five.